Cassini captures Saturn’s largest moon, Titan. 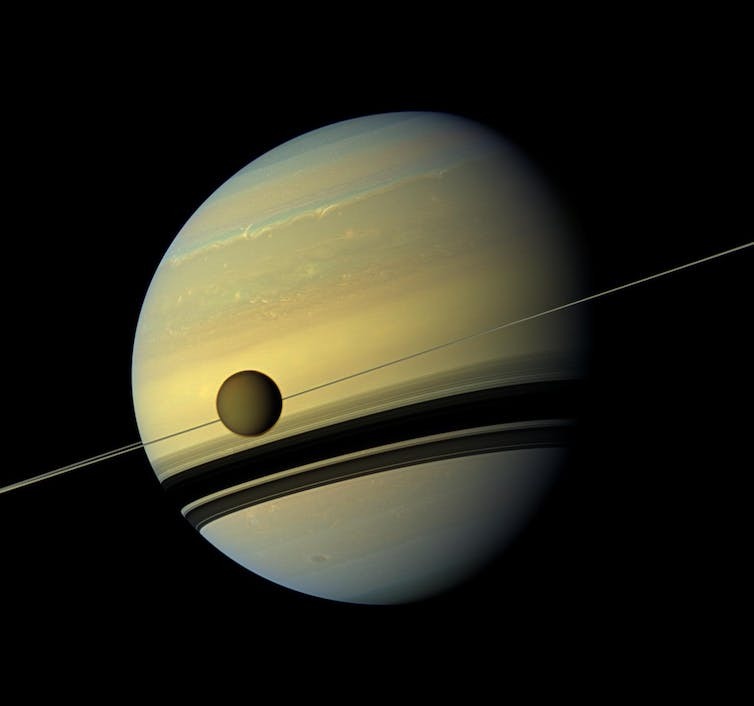 Lakes and seas of liquid methane, rain from hydrocarbon clouds, and evidence of poisonous hydrogen cyanide in the atmosphere of Titan were just some of the discoveries the Cassini probe made of Saturns’s largest moon. The space probe has now made its final pass of Titan as it heads towards its grand finale plunge into the ringed planet later this week. Dubbed Cassini’s “goodbye kiss” by NASA, Titan has been the subject of much scrutiny by the probe, with 127 flybys on its 13-year mission exploring the planetary system. One of Cassini’s greatest feats is its contribution to untangling the complicated chemistry of Titan, no doubt one of the more chemically diverse objects in our Solar System. 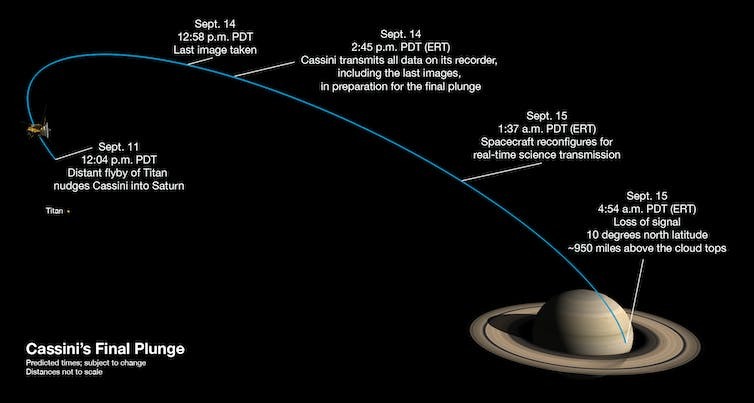 One last look at Titan on Cassni’s final journey. We have known for some time that the combination of ultraviolet rays from the Sun and particle bombardment has altered the mainly nitrogen and methane atmosphere over time. This chemistry has sustained a thick, orange smog layer surrounding the entire body, shrouding Titan’s oceans and landscape from view prior to Cassini’s arrival. The murky orange disk of Saturn’s moon Titan. 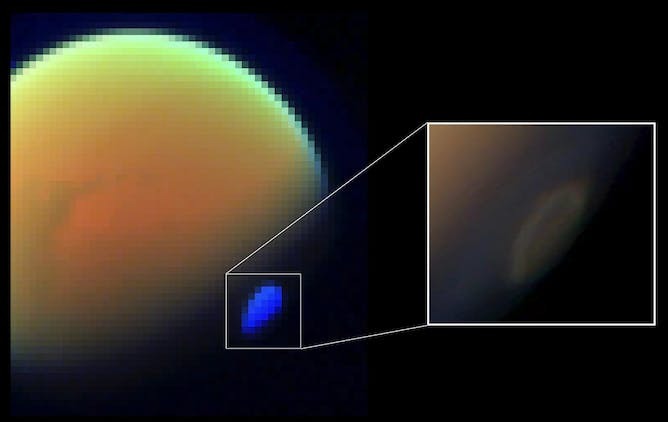 With Cassini’s toolkit of advanced sensing instruments – combined with atmospheric sampling by the Huygens probe during its 2005 descent to the surface – the mission has developed a comprehensive picture of Titan’s chemistry. Touchdown on Titan with the Huygens probe. Intriguingly, on top of the hundreds of molecules accounted for, chemical models developed here on Earth incorporating Cassini data predict the existence of even more complex material. Of potential significance to biochemistry, these molecules have evaded observation over the relatively short Cassini mission, being either out of view or present at levels below the detection limits of the equipment. Even if only formed in small quantities in the atmosphere it is plausible that these life-bearing species have built up on the surface over Titan’s history. So what are these chemicals and how do they come to be? This composite image shows an infrared view of Saturn’s moon Titan from Cassini’s flyby in November 2015. The near-infrared wavelengths in this image allow Cassini’s vision to penetrate the haze and reveal the moon’s surface. Unlike Earth, oxygen atoms are rather scarce in Titan’s atmosphere. Water is locked as surface ice and there appear to be no abundant sources of O₂ gas. In oxygen’s place, we see nitrogen play a more significant role in Titan’s atmospheric chemistry. Here, common products of nitrogen reactions are the cyanide family of compounds, of which hydrogen cyanide (HCN) is the simplest and most abundant. As the numbers of cyanide molecules build up at lower, colder altitudes they form cloud layers of large floppy polymers (tholins) and budding ice aerosols. As the aerosols descend to the surface, shells of methane and ethane ice form further layers on the exterior. This acts to protect the inner organic material on its descent to the surface before being dispersed in hydrocarbon lakes and seas. 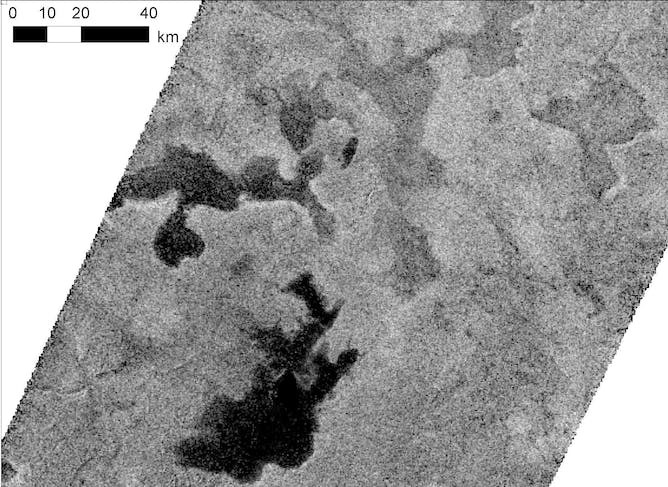 Cassini’s view of Titan’s high northern latitudes in May 2012, the lakes on the left are full of liquid hydrocarbons while those on the top right are only partially filled, or represent saturated ground or mudflat. Surprisingly it is these cyanide compounds, chemicals closely associated with toxicity and death to Earthly lifeforms, that may actually provide avenues for life-bearing biomolecules to form in space environments. Some simulations predict that cyanides trapped in ices and exposed to space radiation can lead to the synthesis of amino acids and DNA nucleobase structures – the building blocks of life on Earth. Excited by these predictions and their implications toward astrobiology, chemists have rushed to explore these reactions in the laboratory. 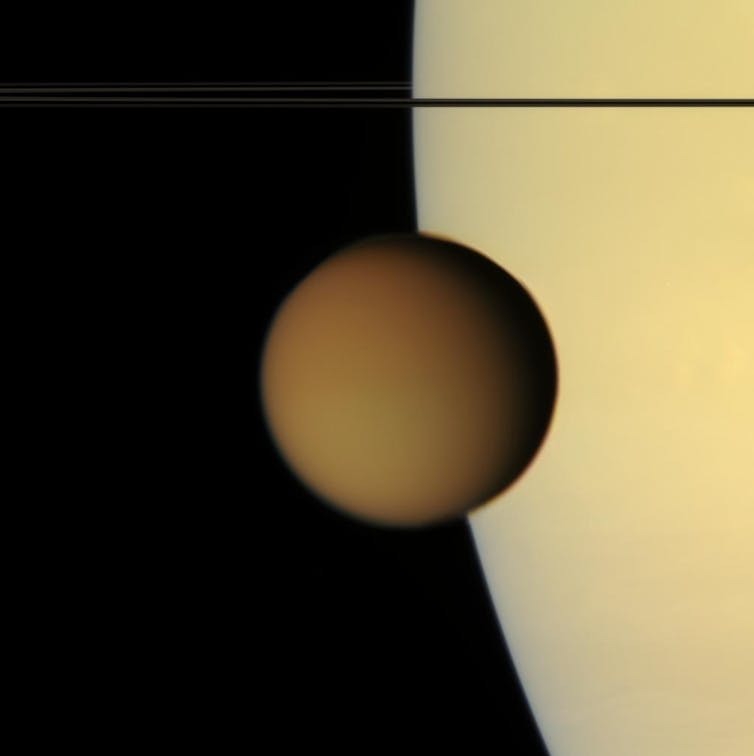 Our contributions to astrochemistry have focused on simulating the atmosphere of Titan and its cyanide haze. With a specialised gas cell installed at the Australian Synchrotron, we are able to replicate the cold temperatures associated with Titan’s cloud layers. Cassini’s spectrum view of the southern polar vortex shows a signature of frozen hydrogen cyanide molecules (HCN). 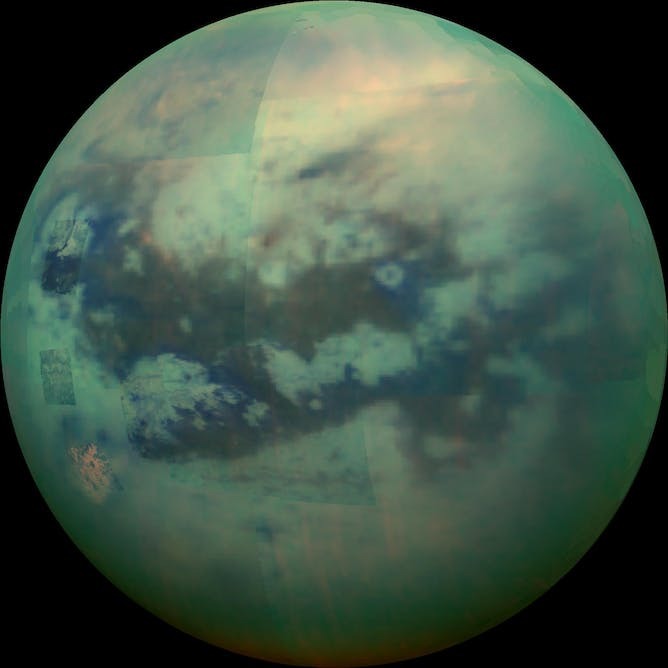 By injecting cyanides (the friendlier variety) into our cell we can determine the size, structure and density of Titan aerosols as they grow over time; probing with infrared light from the facility. These results have provided us with a list of signatures for which we can locate cyanide aerosols using infrared astronomy. The next step will be to seed these aerosols with organic species to determine if they can be identified in extraterrestrial atmospheres. Perhaps these signals will act as a beacon for future explorations designed to search for complex organic material in more remote space locations – potentially even on the “giant Earth” exoplanets in distant star systems. Space provides us a unique perspective to turn back the pages of chemistry. Among the planets, moons and stars – and the not quite emptiness between – we can study the initial reactions thought to have started chemistry here on Earth. Using ever more sensitive telescopes and advanced spacecraft, we have uncovered chemical nurseries – pockets of gas and ice exerted to harsh space radiation – in our Solar System and beyond. Such cold, icy objects as Titan, the moons of Jupiter, Trans-Neptunian Objects (such as Pluto and other minor bodies in the Kuiper belt and beyond), as well as microscopic interstellar dust particles, all generate higher-order organic molecules from simple chemical ingredients. As far as we know, the lack of heat and liquid water precludes life to exist at these worlds. However, we can look for clues regarding life’s origins on a primitive Earth. Were life-bearing chemicals delivered via comet impact, or made in-house near the early ocean shores or deep sea volcanoes? Observing the chemistry of distant objects could one day provide the answers. These forays into our chemical history have been enabled by the significant steps we have taken in our exploration of space including, as a glowing example, the resounding success of Cassini’s exploration of Titan.